Proton Edar is targeting an increase in sales by 20% this year from the 141,000 units sold in 2012, says CEO Hisham Othman. Speaking to Bernama, he cited the introduction of new models as an important driving factor. “We have indicated that we will be coming up with a C-segment hatchback model by the middle of the year,” Hisham said, adding that quality, safety and excellent customer service are “vital” to improve Proton sales. 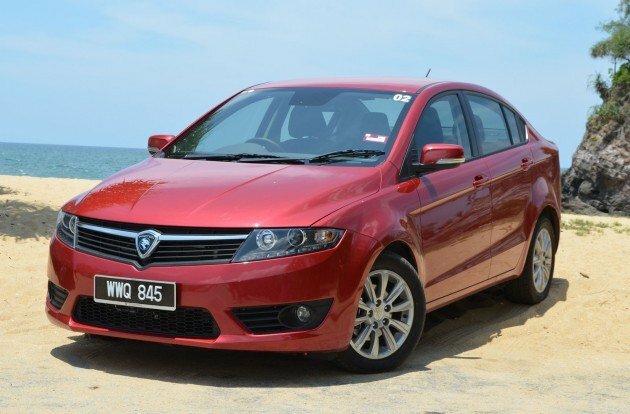 According to the report, Proton recently strengthened the body of the new Saga model (FLX+), added dual airbags and made other adjustments based on customer feedback, while retaining its price. Hisham also told Bernama that the Proton Preve (pictured above) has benefited from adjustments to the engine management unit to improve engine response. The C-segment sedan was recently awarded a five-star Australasian New Car Assessment Programme (ANCAP) safety rating (see picture below). Proton’s sales and service network now consists of 230 sales branches and 285 service centres nationwide, Sabah and Sarawak included. The report further states that currently 5,130 cars are serviced daily across the country; Proton aims to lift this number to 5,265 next year. “We make sure every single outlet gives exceptional customer service and performs up to standard,” said Hisham. Improvements made include shorter waiting times, the provision of courtesy cars for repairs that take more than three days to complete (excluding accident repairs) and the introduction of SOPs for customer complaints in which every single complaint passes through top management. Presently, 40 courtesy cars are available; by the end of this month another 30 will be added to the fleet and by the end of the year all outlets will provide the service, according to the Edar CEO. “After consolidation, our service is streamlined, with increased efficiency in areas such as standard adoption and spare parts management,” he said. “It used to take about five to 10 days to receive approval to replace parts; now it can be resolved in just two days,” he added. Although servicing contributes a relatively low 10-15% to Proton’s revenue, Hisham bills it a “deciding factor” where sales are concerned, saying that retaining customers and making them happy were important. Really hard to see this car on the road, only few of them, i expect 3 each day but…also i found this car is kinda ugly especially the tail lights and the front end! interior is ok coz it’s better than Saga FL so i think the interior is acceptable. Please make the Preve, Preve hatch & other offerings more affordable. Improve on the fuel economy through implementation of technologies such as brake regenerative system, start stop, dual vvti, etc. Streamlining the vendors should brought down the cost. Lower the price, hence, would spark more interest providing there is substantial quality to it eg. make the door close with the sound of solidity, not hollow sounding. The Preve hatch has the makings but the price is the deciding factor. Less is more. I like your optimism, but lets be realistic… The Prevé hatchback will probably be sportier and hence more expensive than the sedan, and sales volume will not be sufficient. However, I am pretty confident that the Preve hatchback will sell like hot cakes overseas, especially in Europe (if it is launched there anyway). If Proton genuinely wants to increase sales, and sales only, they should make an A-segment, bajet car ASAP to challenge the Viva. The Viva has absolutely NO competition when considering its pricing. The no.3 best selling car in Malaysia for 2012 was the Viva (after the Myvi and Saga), simply because it is cheap. Remember when Proton sold the Saga LMST at RM27k in 2007 for our 50th Merdeka ? The 23 year old crappy, dying Saga shot up to second place, right behind the MyVi ! All just because it was cheap ! That, ladies and gentlemen, is how you do business in Malaysia. Malaysians love cheap and free stuff. Don’t get me wrong, I am quite supportive of Proton, but I honestly believe that Proton’s top brass are incredibly incompetent when it comes to doing business. please Proton, bring back Syed Zainal Abidin ! He’s our only hope. Well, did you know that Geely and Chery is ranked in the Top 10 best selling in Ukraine, Bulgaria, Belarus and other small (Eastern) European countries today ? GEELY. That Chinese company which rips off other cars ! If Proton can sell their new cars there, and if they are priced competitively, they will sell, no doubt about that. How do I know ? Because Proton DID IT in the past. If you go to some European countries (not just UK), you will see some very old Proton Wiras and Satrias around. Feel free to check on Google Street View, or the online used car market. Proton can do it…. but they’re just too lazy to be bothered, apparently. I think you made a good point with the Viva. If they were to launch Emas, it would bring a lot of competition. They can make 1.0L and 1.3L variants and possibly a 1.6L to lure Malaysians that are interested in cars such as the Pug 208. Exactly, a bajet version of the EMAS would have been the best thing that ever happened to Proton… but after Syed Zainal left, everything slowed to a halt. Sigh. Anyway, there’s still some hope left. let’s keep our fingers crossed. yeah.. uses the small capacity CFE engine.. like 1.0 0r 1.2L CFE.The cfe got powerful torque & can easily carry a A-segment car. People will buy because of cheap r.tax, powerful and economical engine. And of course looks & safety matters. If not people will say that the car ugly like savvy or car tin sardin like kancil.. you know lah typical malaysian.. always “kutuk” our product & “angkat” the japs bcoz our mind have long been “jajah” by them since WW2. R u sure or not Preves hatch can sell like hot cakes in Europe? they gt Peugeot,Renault,VW, Skoda,Kia and more… maybe the first customer is Jeremy Clarkson. Proton always said improve this improve that in the end still produced low quality cars to malaysian people. Proton is not rakyat benefit didahulukan, should be Kroni/profit didahulukan. Of course its still running on the road but did you count how many times they have to services/repairs their cars in order to continue running on the road compare to the good quality cars. But anyway not all proton car low quality. Buy proton car also depend on luck. My point is proton should put priority 1 on quality not focus on new models. Well said dude. People tend to forgot about that. We can still saw wira on the road because the car is using Mitsubishi’s Engine.. Ya lah.. unlike the exotic italian fiat, alfas.. all jadi tukun. Im not saying that they are not good. Sure alfa 155 got racing history on touring car.. some more on the boxer 1.6L 146.. gives headdick one. but thats the reality.. don’t believe me.. go to kuchai lama.. there a alfa expert workshop & a lot of alfa not road worthy. While you are at it, perhaps train your service personnel with better manners and personality traits. If Proton can improve, I’m expecting a other marques to follow suit. Yes, i’m looking at you, Mr. Naza and Mr. Sime Darby. Now, can I have my Preve hatchback with 6 airbags please…and while you are at it, perhaps a nicer interior that is not dated back to the 90s. You are paying Pininfarina to design for you. Nothing great there. Sales increase? sales for spare parts kot. Maklumlah kualiti buruk. what nonsense are you talking !? If protons quality is on par with the germans, not only malaysia, they will also do well in other countries. My advice to proton is follow what hyundai/kia is doing, hire someone who knows how to design cars, not some ahole whose main credential is that he is related to some politician. And his nationality does should not matter. Anyhow proton is already privately owned. I hate to say this, but if proton is not carefull, chinese manufacturers like cherry will soon overtake them. What nonsense you talking. Before talk about design, they should replace the clowns with people that know how to manage a company. Puppet or not, people are selling much more cars than you. Proton has to push harder and come out with new models faster and meeting all the future EU regulations and also not only ANCAP rating but also Global NCAP and EuroNCAP rating standards. Proton has to equip same equipment levels for domestic market too. EuroNCAP has announced that starting from 2014, Autonomous Emergency Braking (AEB) will be included in EuroNCAP’s overall star rating. It is compulsory for Proton to install this system for all the models including facelift models and of course for the all new models to archive the 5 Star Rating. If you launch model late, for sure you will not meet the regulations. Preve archived 5 star rating in ANCAP recently. But in November 2013 and the latest January 2014, it will not get five star once it hit the road in Europe such as in England. So, this Preve have to install AEB to archive 5 star rating. Make sure (Proton) also install this system for domestic market including the upcoming P3-22A Preve Hatchback (at least for high line variant at first). This system should be ready and in the list even on November 2013 for domestic market. Proton, are you ready for this? Proton should always keep updating what’s next for EU regulations and NCAP and other automotive standard for year 2014-2016. Some already released by particular organisations. Typing mistake. For you info, I copy and paste. Typing mistake. For your info, I copy and paste. Meaningful R&D first !!! Number come later. if, i say if, after election the import cars price drop 20%, i think proton’s sales will drop 50%…. PKR say, 20% reduction on Car Excise Duty each year, for 5 year. Not 20% on import duty. then after 5 year only, we’ll see a real care sales. Before that happened, people will stick to their current ride. if others drop 20%, proton cheapest will drop too… you know how many ppl are in that price bracket that proton can hook up to? have you heard about problematic DSG? Yah problem DSG. But VW golf is car of the year for how long odi? Which car sold the most units in EU? Let’s talk business. Have you heard of Skoda? asians go for reliability, europeans go for tech. have you learnt marketing? how can they stated that preve is 5 star NACAP in malaysia? the australia version come with 6 airbag, proton offers 4 airbags version in Malaysia. Malaysia version has not been tested, should come with no rating. this is not professional and ethic. 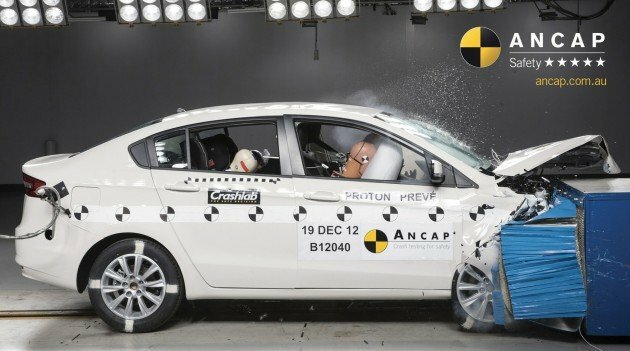 Having said that, all cars in malaysia are not tested except those few who ran through Asean NCAP. You are basically correct about Malaysian version of Preve Premium should not equate to the one sell in Australia. However, we can only take that as the basis of how safe is Preve compare to other Proton cars, or even non-proton cars on the same price bracket. Preve CFE is still the safest car in it’s price range. Sonif 6 airbags got 5 stars… N local preve got 4 airbags… Then how many stars for 2 airbags, vios, civic, camry, avanza? ?prffthhhh 0 star?? The Best car in Malaysia. Last night I drove Preve overtake a Golf Tsi on Kuantan Highway! like drinking water.!!! very powerful car. Come test with my Tsi…make sure ur car stock ar..
in the end of the day, it is still a proton. Of course. At the end of the day your Honda will still be Honda. Not BMW. Perodua still Perodua. Yeah,I saw that in your dream. Maybe overtaking an Aventador next time. hybrid car no excise duty also mahal ma…. about quality suzuki swift got steering rack issue…honda also got ecu trouble….waiting parts for japanese cars more 3month proton 2-3 days only more chepest. then buy made in bangla cars it’s very durable, last for 100 years, haha! hope proton can rework the interior design , such as door padding especially. recalculate the steering reach. and other refinements. I have no problem so far with proton cars. And, I have owned quite a few before, wira, satria, Perdana, neo and currently inspira. So far I have not encountered the problems mentioned, and believe it or not, even the legendary power Windows problem. And if you ask me, I would say proton quality is good, and the price is cheap. That’s the different between people who know how to take care of a car and those who know how to blame the manufacturer when they them self doesn’t do the basics of owning a car. you nailed it… good point! If that’s the case why Proton car don sell well (local & oversea)? Is that b’cse we bashers that trouble their sales? I admit some CKD car also got quality issues but why people complaint more on Proton then theirs? Is that b’cse majority of consumer or people who comments here don own proton cars or simply bashers? after overtaking Golf tsi….. i’ve been smoke by Nissan Teana 2.5L V6! Damn! Lol… Golf tsi owner just relax his right foot to let u pass. Proton needs to step up its game. Cmon proton/drb. Give us what we want, and make that sooner rather than later . Give us newer engine tech. Cfe is a nice start, but even that is now more than a year old. maybe give us cars with incorporating technology derived from petronas e01 engines. Give us cars equipped with REEV (proton’s hybrid tech) . Perhaps the upcoming preve hatch will be launched with either one of these technologies. Give consumers like us something bold and pleasantly unexpected. Preve Cfe hybrid via REEV technology – let’s start with that. Give us that. Cmon DRB. I do believe DRB hicom can do better…because before they own Proton…they manufacturing the military grade vehicle….nothing can beat the quality of military..
Proton Mat Jenin day dreaming again. What proton should do is to improve quality. Its quite a shame when a company of almost 30 years old cannot perfected the qc of their product. Mayb too much politicking involves in running proton.. Too much crony companies that can’ t be touch though they can’t cope with quality requirement set by proton.. no wonder proton is given to drb management..! Only drb can guarantee the fate of cronies from facing the stick. I do believe DRB Hicom have a military grade quality. I am sure Proton’s target was 200K sales last accounting year as dictated by your EC. Now suddenly back to 140K? Why? You did not acieve it? Why ddid’nt you announce your sales figure? i can just say, all the best to Proton. Is there proton inspira still selling ? Dun talk proton pls prove it by slashing your vehicle price,Improve your quality and vendor issues and most of all educate your service centre staffs to be more proactive,Initiative and courteous.Have the IAFM issue being solve?First gen Campro is much reliable than the IAFM.Dun blame the plastic Bosch sensor and you should know plastic only goes well for 4 seasons countries not tropical climate like Malaysia.Fanbelt and engine bay flooring can be improve.Prove to rakyat that u can sell a base model saga fl with 2 airbags,A proper audio with integrated DVD for under RM35k.